Turambe Shoppe was opened a few months ago by an American with a love of food keen to combine a grab-and-go concept with high quality and healthy meals. 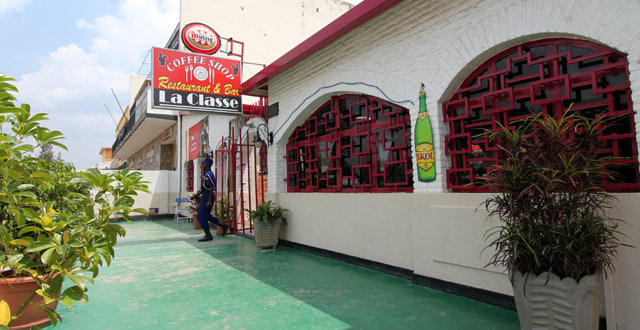 It’s located next to the Kigali Public Library in Kacyiru and it’s a dream for anyone who’s sick of eating out at places in Kigali where starches and fried food reign supreme. Thankfully, this super cute new place has a menu that’s packed with healthy options and they manage to give us good-for-you food with a selection that goes beyond a salad with tomato, onion, and avocado on it. It’s open during the week from between 11am and 7:30pm and is mainly a lunch and early dinner place and very popular with the area’s office and embassy workers. I’ve eaten at Turambe Shoppe five times now and I’ve been impressed every time. I love their concept of offering healthy food fast, either for takeaway or eating in front of the restaurant on their cute little patio. They have a small but very nice selection of soup, salad, and sandwiches along with muffins and smoothies. They have five salads and two choices each for soups and sandwiches but their menu changes occasionally which means you’re not likely to get bored with the selection. I love seeing places that don’t try to be all things to all people and prefer small menus where I know each dish has been well thought out and perfected. I love this place for their salads. Mostly because it’s really hard to find a good salad in Kigali but also because of the ingredients that you’ll only find here. For example, their Chicken Caesar Salad (Rwf 6,500) actually has Caesar dressing, buttery croutons, real Parmesan cheese, and they step up their salad game by adding a good helping of curly kale into the mix. The only Caesar salad in Kigali that even comes close is at La Terrasse at Hotel des Mille Collines but the dressing doesn’t even compare. Seriously. Turambe Shoppe’s Caesar dressing is worth the trip alone and they’ll sell you a small tub of it for Rwf 300 which is a total bargain. Their other salads are amazing as well and I’d recommend trying the Asian Chopped Salad (Rwf 5,800) for the delicious dressing and the Strawberry Balsamic (Rwf 6,500) because I can guarantee that it’s the only place in Kigali you’ll find berries on a salad and, lets face it, berries on salads are awesome. There’s also an apple, goat cheese, chicken, walnut salad (Rwf 6,500) and walnuts on salads… also awesome. The salads may seem pricey at first but they’re huge and the quality of the ingredients they use make it worthwhile. Their soups are great too and perfect as the gloomy rainy season descends upon us. Keeping with their healthy mandate, they offer soup packed with veggies including a vegan lentil soup with kale, carrot curry, and a cauliflower potato soup. Their selection varies so make sure to check their menu online to see what’s on offer this week. I mostly eat in when I visit Turambe Shoppe and I’d prefer my soup served in a bowl with a proper spoon… but more on that later. 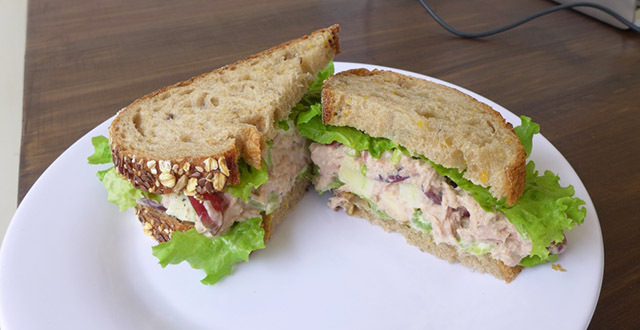 I’m a sucker for a good tuna sandwich but have yet to find one I’m truly in love with. La Sierra used to do a pretty good one for takeaway but their bread lately doesn’t seem fresh. I just discovered a pretty tasty one at Ubumwe Grande but at Rwf 7,000 (including chips) it’s a bit too pricey for the likes of me. Luckily, Turambe Shoppe also do sandwiches and their deconstructed tuna salad sandwich (Rwf 3,500) is a winner! I’m somewhat confused about why the thing is deconstructed… I’m not sure I’ve ever seen an assemble-it-yourself sandwich before. My guess is that it makes it a bit easier to transport for those folks who are taking it away. Plus I guess you can also choose how much filling to use and take any leftovers home. But sandwich construction confusion aside, it’s amazing. The filling has grapes, apples, and celery in there which adds a crunch and flavour that I wasn’t sure I would like but I totally love. They use Greek yoghurt instead of mayo to hold the whole thing together which means it’s much healthier and you won’t even notice the difference. In addition to soups and salads, they also have a few other goodies like a Spicy Bean Dip (Rwf 2,300) with crispy tortilla chips, and a couple of different kind of hummus (Rwf 2,400) with fresh veggies for dipping. Throw in a selection of muffins and smoothies and Turambe Shoppe really does have a lot of choice packed into their three fridges. They even give out free muffins on Fridays! As you can probably tell, I really love this place and I’m excited to see a new place open up with such a unique menu and way of doing business. One thing I’m not so crazy about is the packaging. I understand that having a takeaway place means having takeaway containers, but I’m not sure why I need to eat out of plastic when I choose to dine in. Maybe there could be two packaging choices in the fridge – reusable containers so that people who are eating in can take one of those and the plastic option for people who are taking away. I’m sure there’s a reason behind this but if it’s about speed, I’d much rather wait 25 minutes for someone to make me a fresh salad and put it into a glass bowl with proper utensils. Partly due to environmental reasons but also because it’s really freaking hard to eat salad with a flimsy plastic fork. I know the owner is working on more environmentally-friendly solutions for the takeaway customers and I hope there are also improvements on the horizon for those of us who like to eat in. If you don’t want to make the trek out to Kacyiru, Turambe Shoppe are happy to send a delivery for a Rwf 1,000 fee, just call them directly at 0789 911 168. Or pay them a visit in person to check out their lovely little space. Service is friendly and the place is designed to give you a meal as quickly as possible so it’s a great place to come if you’re in a rush. 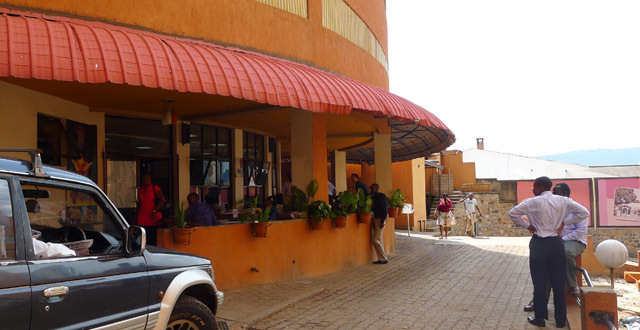 Turambe Shoppe is the kind of place that makes me excited about Kigali’s growing food scene. It’s so great to see a new place that has an innovative concept, a unique menu, and a grasp on the importance of offering quality food consistently and it’s become one of my go-to places for lunch. Take note that they sometimes offer a 50% discount on their remaining meals after 4pm on Fridays (check their Facebook page for the deal). Pop by and give them a try and let us all know what you think in the comments below! This place is fantastic, try the hummus. They even make a beet hummus, gluten free muffins on Friday! Great smoothies and salads in a nice atmosphere cannot recommend this place enough.